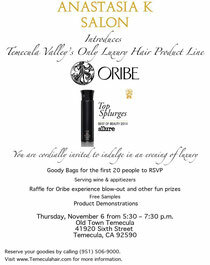 On Nov. 6th, 2014 Anastasia K Salon will be introducing Oribe haircare products to the Temecula area please come and join us at our event at 41920 Sixth st. Old Town Temecula, Ca. From 5:30-7:30pm There will be complimentary wine and hors d'oeuvres as well as product samples and service giveaways. Call 951-506-9000 to RSVP. The first 20 to RSVP will receive a goody bag, bring friends and family and lets have a party!